Have you got a messy collection of music, playlists and albums from your favorite artists on iPhone, iPad or iPod? Is your iOS device overloaded by audio tracks leaving insufficient space for more photos, apps, videos, etc? Or are you totally get tired when organize iPhone music one by one through Apple Music app? If your answer is yes, you need an iPhone music organizer to manage and organize iPhone music in order. You may think that it is good enough to use the native products of Apple like iTunes and iCloud to organize iPhone music, but disappointedly such programs are limited in what they can do and often require much from you. For instance, iTunes only manage purchased music and iCloud ask you at least $0.99/month to store more music files. So, choose a third-party iPhone music organizer like DearMob iPhone Music Manager is an advisable and wise choice to clean and sort your massive iPhone music library. DearMob iPhone Music Manager has a compact user interface and good set of built-in attachments for working with your Apple Music library and organize music on iPhone iPad and iPod, like seletively transfer songs, batch-delete audio tracks, edit music info, create playlists, etc. As easy as ABC, handle every song at will. Great Compatibility: DearMob iPhone Music Manager was brought into being as people need to organize iPhone music in the easiest way. It is not designed for the mere iPhone handsets (iPhone 7/6S/6 & Plus/SE/5S/5/5C and the newcomers iPhone X (10)/8/8 Plus), but also for iPad (Pro/mini/Air) and iPod. No matter you use a Mac powered by Mac OS X/macOS Sierra/macOS High Sierra or PC shipped with Windows 10/8/7, you can use this iPhone music organizer to connect your iPhone to computer with USB cable to orgainze music MP3, AAC, ripped CD songs, downloaded or purchased music on your iOS devices. Humanized Design: Once your idevice is connected to computer through this iPhone music organizer, you will see all music songs on your iPhone are grouped by Music list, Artist or Album. And you can easily find the sepcific song from an artist using Search function even though your iPhone is fulled with hundreds of Apple music. On the top bar of the main UI, DearMob iPhone Music Manager offers you one-click buttons to orgainze iPhone music in a flash including export iPhone music to computer for secure backup, download non-purchased music, edit iPhone music info for easy classification and delete iPhone music to free up iPhone. DearMob iPhone Music Manager is the ultimate tool to satisfy what you didn't notice before and offer what you require in the future on organzing iPhone music. Powerful Functions: As what are mentioned above, DearMob iPhone Music Manager organizes iPhone music in different ways without iTunes' help, making it better than any native Apple product like iTunes (iTunes not recongnize iPhone problem happens often), Apple Music app or iCloud and any other similar product that need iTunes to manage iPhone music. Aside from that, it is available for you to one-click create preferred playlist like pop, jazz, rock, etc to store favorite songs, convert MP3 to iPhone ringtone from your favorite music and remove DRM from iTunes Apple Music as well. How to Organize iPhone Music with DearMob iPhone Music Manager? 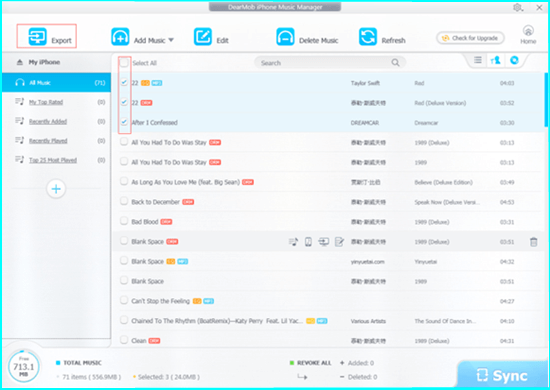 Before organizing iPhone music, you should first free download DearMob iPhone Music Manager, install and launch it on your Mac or PC. Then connect your iPhone to computer with the Apple original USB cable and tap Trust to continue if there is a message poping up showing "Trust this computer or not". Often the case you transfer songs to iPhone with wrong music information or without any info of artists, albums, published years, etc that it is hard or time-consuming to make sure the specific song comes from which artist or album. By editing the music info, you can easily find a song, an artist or album through Search function. If you are a music lover, you certainly have collected sizeable music and there are more or less duplicate songs on your iPhone. Want to erase these audio tracks to add more songs or just free up your iPhone? Deleting them with DearMob iPhone Music Manager is a good way. This iPhone music organizer will batch-delete the unwanted music files in seconds, plus transfer them to computer first for backup before deletion. DearMob iPhone Music Organizer allows you to create new playlists by music type, artist, release year, album, etc to catalog music library on iPhone, iPad and iPod. Once again, iTunes and Apple Music app can help you organize iPhone music indeed, but a bit complicated and time-consuming. If you need an easier way, DearMob iPhone Music Manager is the one to help keep every music on iPhone without iTunes, so do iPad and iPod in order, in control and without iTunes. If you upgrade to the Pro version, you can manage more files on iPhone/iPad like DRM files, photos, videos, books, contacts, messages, voice memos, bookmarks, etc.